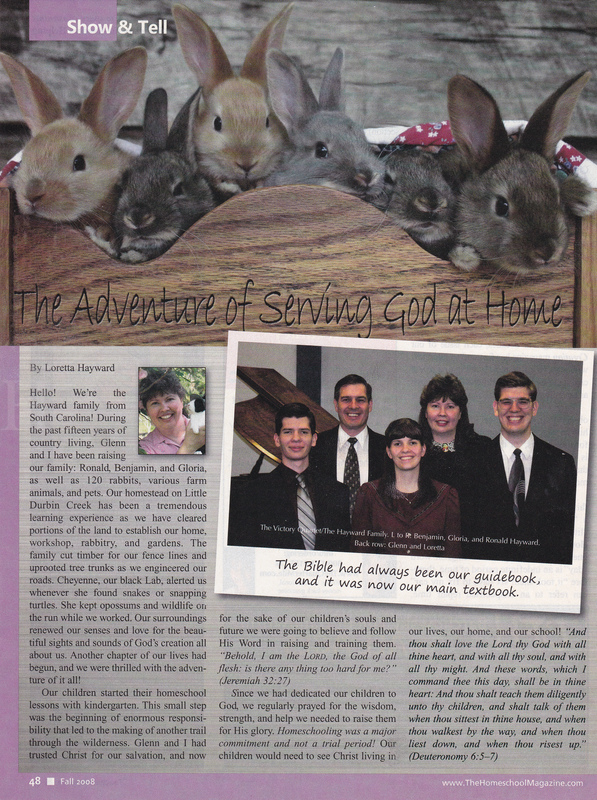 An article on our adventures raising rabbits was published in The Old Schoolhouse Magazine! Each morning we visit our rabbitry where we are greeted by our eager bright-eyed furry friends. Our bunnies have wonderful ways of expressing their excitement! Whether they tug at their hutch doors, rattle their empty feeders or bound back and forth momentarily stopping to peek out of their hutch window to see if you are coming over to visit with them, they anxiously await a visit to their hutch. Our rabbits are not camera shy and you will see on our website pages how they like to pose among the flowers and explore our gardens! 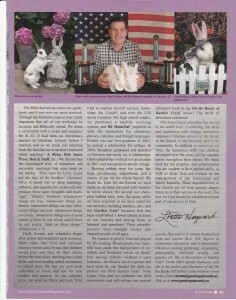 We certainly enjoy working with our rabbits and we hope that it shows! Hopefully, you will fall in love with our rabbits and want to take a bunny home with you! We have now made that possible-when you buy a Garden Gate® Note Card!! 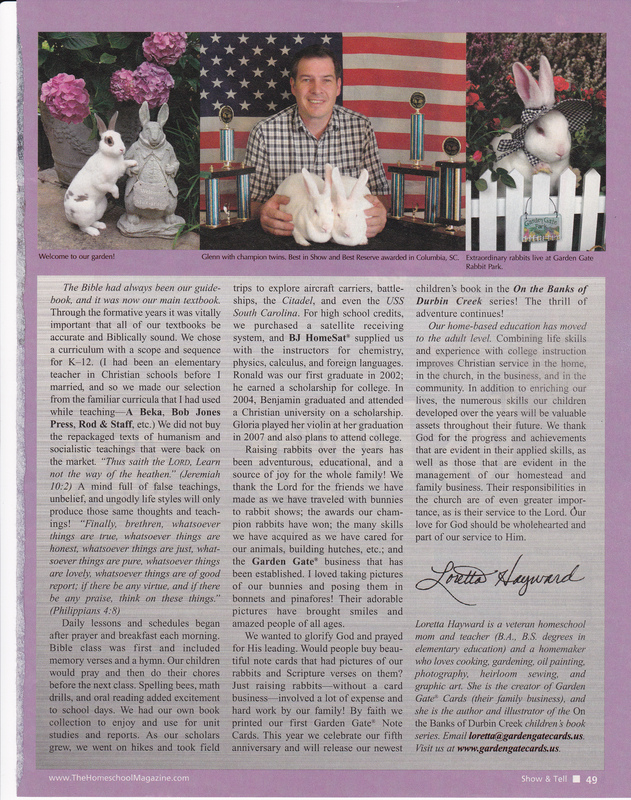 Here in South Carolina at Garden Gate Rabbit Park our family raises award winning show rabbits. Our rabbits have pedigrees too! ( Imagine that!) Of course our rabbits love the gardens as much as we do, and only briefly pause to pose before nosing about to find something edible to nibble while I take their pictures. Photographing rabbits can be quite a challenge. Rabbits do not stand still. There are many distractions when toads hop onto the scene, a clumsy skink (lizard) drops down from the tree branch over head or a neighboring dog comes down the road for a visit! We never know when our flower garden or one of our flower “settings” will become rabbit lunch! The more pictures that we take the more proof we have that the lovely flowers are irresistible and are disappearing! Garden Gate® Cards and books are the result of much hard work done by my family. We are sharing with you a personal experience or special occasion we have had with our rabbits through every illustration and photograph! Those precious rabbits and expressive faces make Garden Gate’s beautiful products possible! Our very popular “On the Banks of Durbin Creek” children’s book series endear our rabbits to everyone’s heart while leading readers on an adventure! Every color photograph features real flowers, lovely gardens, and our adorable bunnies! Garden Gate® products are a feast for the eyes and food for the soul! What delightful greetings and gifts you can send to your family and friends! Our products are made in America of the finest quality and are truly extraordinary in every way. They are beautiful for personal use and appropriate for any occasion and age group! Garden Gate® Cards are a beautiful way to share sunshine and flowers with a dear friend! 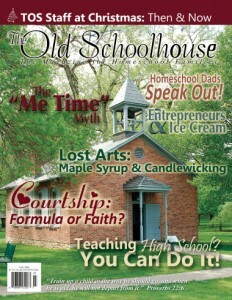 Joe Wheeler, Ph.D., is considered one of the nation’s top anthologists of stories. He is best known for his best-selling Christmas in My Heart series (Gold Medallion Finalist in 1995) and Great Stories Remembered series (awarded Family Television’s highest award, “The Seal of Quality” in 1996). He is professor emeritus at Columbia Union College in Takoma Park, Maryland; general editor at Focus on the Family; and cofounder and executive director of the Zane Grey’s West Society. ” I remember buying Volume 14 of the ” Christmas in My Heart ” series (though at the time I did not know there was a series!) for my daughter’s Christmas present. The illustrations were captivating lithographs and the variety of story titles were intriguing. I personally love beautiful art and great literature. To find them both together in one volume says a lot about the author and that could mean quality as well as a rare find among books today. Of course before I purchase a book for myself or others I like to examine the contents for subject quality and also to be sure that there are no objectional elements. After purchasing the book I found that it would be a delightful addition to my daughter’s collection. It was the first of a whole series of “Christmas in My Heart” volumes that I would eventually purchase and our whole family would enjoy over the years. Some evenings we read aloud for family entertainment a selection or two from a Christmas in My Heart book. Our hearts are knit together as we share the experiences of a family stranded by a blizzard, or what Christmas can mean to an orphan. Life is enriched by hearing the stories of God’s mercy and loving kindness to both the old and young-rich or poor! It is marvelous how many people are meeting the needs of others and sharing the Spirit of Christmas as God planned. I have now written and illustrated a couple of children’s books that I wanted to send to some authors for review. What a splendid work of art your books and calendars are! Yes, most definitely you ought to create a book dealing with the daunting task of dress-rehearsing rabbits! “A child lives in two worlds at the same time: the real world and the world of the imagination. Sadly, adults are forced to live in only one world at a time, thus losing much of the sense of wonder that gives childhood its magic. But, with a child on our lap, and the stunningly beautiful Four Seasons for Bunnies open in front of us, if we’re lucky, perhaps we can explore the world of make-believe together. — Joe L. Wheeler, Ph.D.
What a joy and treasure!! I may never sell many books but the people that read them- love them!! Oh How I hope to publish more of my books!! The pictures and stories touch hearts in a number of ways! People are talking about those “adorable bunnies” pictured on the extraordinary Garden Gate Note Cards, books and calendars. Is it the homespun-country theme or the delightful expressions of bunnies in flower gardens that make Garden Gate Cards so popular? The beautiful flowers, gardens, bunnies wearing bonnets, Dutch sailors posing in a rowboat on Durbin Creek and even the South Carolina snow are all very real! All of the colorful photographs on the Garden Gate products are amazing rare moments Loretta Hayward has captured with her camera. The friendly bunny faces amuse everyone and are a continuous source of enjoyment and inspiration ! The Glenn Hayward family of five operate the Garden Gate card business. Their love for their country home & family flows into their business. Though they are a small family business, they give attention to important details with their personal, friendly service, & excellent products made with the help of dozens of our local businesses located here in the up state of South Carolina!